"Ambition without direction can be self-destructive. Well regarded and highly capable, Elaine presently serves as the Minister of Culture. 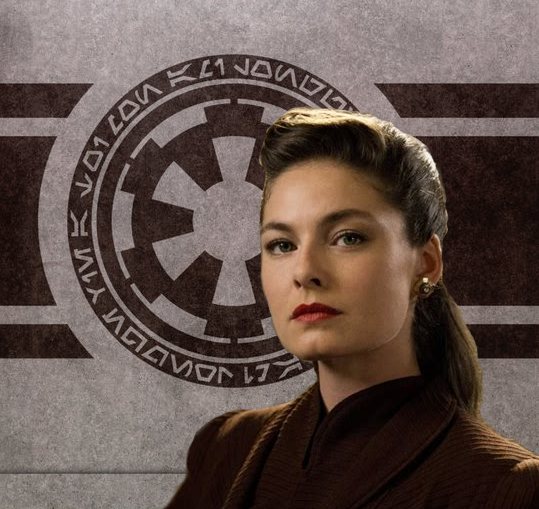 As a devoted member of the Empire's Political Party, she holds a seat in the Select Committee and is charged with leading engagement strategies for the Empire's citizens. In the past she served in the Regional Government, Bureau and as a lower ranking member of COMPNOR. 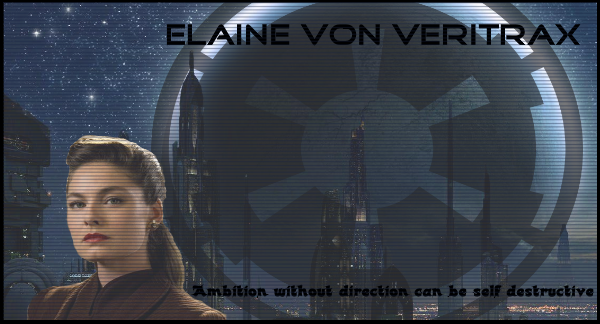 Elaine von Veritrax started her career in the Akheton Corporation prior to taking up her cause for the Imperial Union with the Tresarian government. Following the acquisition of Akheton by the Trade Federation - a former member of the Imperial Union – and their consolidation of the Naboo system Elaine shifted focus and met with a Tresarian recruiter. Upon her acceptance and graduation from the Tresarian Academy, she was subsequently transferred to the Tresarian Fleet where her experiences as a member of Akheton's sprawling and logistically demanding production and construction endeavors were tapped into and developed even further. Deciding military service was not as rewarding as she hoped she resigned from Tresario. Soon after, she decided to move to the Empire, seeking to dedicate herself to a greater purpose. The ideals of the New Order spoke deeply to her and she quickly affixed herself on becoming a permanent fixture in the machine of Imperial efficiency. Securing a position in Regional Government, Elaine attracted the attention of many an officer, for both her efficiency in work and her ability to execute tasks whilst anticipating future needs, resulting in her "being one to keep an eye on." A successful Bureaucrat she has moved in and out of service with the civil agencies of the Empire in the Regional Government, Imperial Security Bureau and COMPNOR. Elaine was born to a moderately powerful Hapan family, which relocated while Elaine was still young to another world within the Hapes Cluster far from the court politics of the Hapan nobility. On this far-flung world, the house gradually expanded its wealth and knowledge under the guidance of her paternal grandmother, members of the family mastered various arts and made themselves indispensable. The success enjoyed by the family greatly developed after her father discovered and developed a new propulsion system for the monarchy of Naboo. As a result, her grandmother again uprooted Elaine as a child when their family left the Cluster for Naboo. 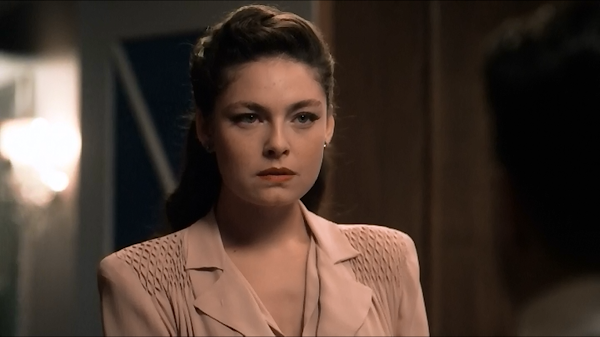 There, her grandmother raised her; teaching her the arts of business, political intrigue, and grand strategy of warfare in the hope that Elaine would kindle the fire that flowed in her veins. Elaine's mother Ilyna was the younger of two sisters borne to Judith von Veritrax - Elaine's Grandmother. Following typical Hapan Culture Elaine's aunt Adalia would have assumed the role as head of the family matriarchy, a problem that was recognized by her grandmother. To her grandmothers dismay Adalia bore only male children, men in typical Hapan society were seen as a lower class citizen, as a result Adalia's eldest sons wife would bear the responsibility of assuming the role if the line of succession wasn't crushed. So at the ripe young age of 13 Elaine returned home with her grandmother and attended a large family gathering in the Cluster. Unbeknownst to her at the time her cousins, aunt and uncle were the targets of Hapan family politics. The family ate and laughed and all was merry. The party drove on late into the evening and it came time to depart, as the family members took off towards the docking area Judith, Elaine's grandmother led Elaine away from where the ships were held. Several minutes later Elaine watched in horror as the docking area erupted into flame and debris. The matter of family succession was resolved. The ride back to Naboo was filled with anger, disbelief and fear. She would now be the target of subversive activity the rest of her life. Her future rest in the hands of calculating every possible move of those around her. It would shape her future and where she would go as well as her desire to attain excellent results in everything she touch. Most of the days Elaine spent on Naboo were long and tiring - her grandmother ensured each day was full of learning, rehearsing etiquette and manners, and pushing Hapan societal influences. All in an effort to secure her a position of power in the Corporate government that controlled Naboo later in life. When Elaine came of age, her diligence and devotion to excellence in her youth was rewarded, as the company was all too eager to take her as an employee. With the company, she developed factories and oversaw production operations; Elaine's expertise was critical to streamlining production pipelines to make the Corporation more effective. However, this success in Akheton was short lived as a majority of shareholders sold to the Trade Federation. The resulting acquisition and subsequent merger of Akheton into the Trade Federation conglomerate. With the overwhelming culture shock Elaine resigned and left Naboo in exploration of new ventures. Reeling from the sudden loss of belonging Elaine took to space, flooding in childhood memories of the sheer depth of the dark abyss. For Elaine space was cold as ever as she lay curled up in bed on her Starrunner-class Starship, Vendrix. The small vessel and her meager savings was all she had as she spent many days traveling the galaxy. Eventually arriving to the sectors controlled by Tresario, far away from the rolling hills of Naboo. Here she found a small sense of belonging she was eager to begin life anew, the merger of her previous employer forcing her to sell her only home - a meagre flat at the time, and leaving her no choice but to live in her vessel. She was hours from Bak`rofsen; she had booked a landing site for the next two weeks - enough time to find a place to live on the strange planet. From the cockpit as she sat in the captain’s chair, she could see in front of her a massive array of warships and civilian vessels flying back and forth. A shadow came over her ship and a communication request flashed on her dashboard. Her hands flew over the console, expertly securing the line and encrypting it. It was her first encounter with a true ship of the line a Mon Calamari warship. Running a sensor scan wasn’t needed, she could recognize the ships class, an MC-60. Elaine immediately responded and plotted a course for the open space lanes and flew to orbit of Bak`rofsen. As her vessel neared the planet she gasped in awe at two massive Home One cruisers orbiting the planet side by side in what appeared to be a patrol pattern. After several minutes of securing access to the planet below, she eventually descended on the landing pad below. Still safely aboard her ship she decided to change her outfit and freshen up. Making her way to the refresher, she turned on the shower, allowing the hot steamy water to relax her muscles and relieve the tension and stress of the past few weeks. She felt like she was home, or rather as close to a home it could be. Exiting the shower, she dressed up and exited the ship. She found the planet to be surprisingly warm and dry as the air hit her face. She couldn’t help but hope that she would adjust to the climate quickly before she set about exploring. Initially, Elaine spent days discovering the Tresarian Recruitment Center, a hospital and several excellent bars and restaurants. She still lived in her ship, and spent some time exploring the planet during the days before formally beginning her recruitment process. Along her travels, she had applied to several local jobs - though none of them were really attractive to her. After six days, she decided that she was finally ready to stop by the center. Inside the center was a young human male, barely a few years younger than Elain. She eyed him curiously; he was attractive, with a stern face, dark black hair and brown eyes; he had a well-toned body beneath a uniform that almost seemed one size too small for him. She clucked her tongue, trying to decide if that was on purpose or not as he rose to greet her. His hand extended and she grasped it, smiling curtly. Before long Elaine was on her way to the Tresarian University less than a week later. Her time in the University was without difficulty: she was fit and passed each physical test with ease, and her time on the range with her classmates was fun and leisurely for her as she was an excellent markswoman. This was a skill she had developed from an early age under her grandfather’s tutelage. As for her piloting skills, she scored decent marks - being an already experienced pilot. All around she was pleased to score perfect marks on her final exam. Returning to her ship, she boarded it and hanged her uniforms while ascending to orbit to receive transport to her first official mission and be assigned to her first Tresarian ship. Her service with Tresario was short, while it filled a void in belonging it lacked the strict structure of her youth she so desperately craved. Such structure and organized social hierarchy was found not far away, at least as was politically concerned for her. She made a decision, to resign from Tresario and take up the cause with the Galactic Empire. Elaine's arrival to Prakith overwhelmed her senses: the sheer size of the planet and its infrastructure was astounding. While Tresarian worlds were ornate and architecturally astounding never before had, she encountered a city-planet of such magnitude and density of population. She was quickly ushered into a massive hall with hundreds of other Cadets, where she was seated and instructed to wait until summoned. Dozens of droids and staff walked through rows of seats, sending and escorting staff to training officers. When, at last, Elaine's turn came, she was directed to the office of Training Officer and, at the time, Lieutenant Commander Mordus Nordstroem. Much to her surprise, his office was empty. The Training Officer was away from the Academy at the time and was instructing operations and training from afar via hologram. He set her to work quickly, directing her to accomplish a list of tasks. Striving to maintain the teachings of her upbringing, Elaine worked as hard as she could to graduate with honours. As her lessons began to come to a close, a mass of electrical storms triggered a planetary defense network to read the energy signals and require investigation. On the orders of her Training Officer, Elaine was quickly dispatched with a pair of stormtroopers to ensure no civil unrest or hostile action had taken place and to provide a detailed report documenting onlookers and intelligence gathered during her thorough investigations of the area. Returning to her studies, Elaine conducted her finals before graduating with honours and assuming her role in Regional Government. One of the first Empire-wide events Elaine attended in her early career was the Imperial Gala celebrating the rule of Emperor Guinar Ndengin the Undying. It was one of her first moments where daring action would help earn her the eye of influential figures and help gain expert development on her career. Elaine had arrived to the palace aboard a JV-7 Delta shuttle in one of her finest dresses. The young officer held her dress as she moved down the ramp of the ship, before making her way to the checkpoint where Elaine presented her ID and invitation with her credentials. The Lieutenant smiled as he handed back her documents and sent her on her way. Moving through the steps leading into the Palace, Elaine gazed in wonder at the immense statues of the Emperor and influential ones of the past. The walk was lined with turbolaser batteries, trained on suspect targets and onlookers to ensure they maintained a good distance from the Palace, unless of course one was an invited guest. Ascending the stairs she came into the main hall and took in a sharp breath. The hall was a work of art unto itself and contained more craftsmanship in a single room than she had ever witnessed in her whole life. Working her way through the hall she encountered Heron Vandroy, a fellow member of the Regional Government, and happily led him, in a curious manner, into the gardens. They exchanged words for some time, before then Director Seele arrived accompanied by his close friend and ally Joer Knight. In a brash and almost daring move she dragged the young Prefect Vandroy with her to pay compliments to the venerable duo. The true surprise, however, was in store for Veritrax as the Director stole her away for a tour of the Palace. Veritrax and Lord Seele passed several retinues of guards and entered into reserved sections of the gardens. Elaine’s tour of the gardens ended near some of the palace roses from which she turned from to look at Seele and she smiled at him as she took his arm, allowing herself to once again be guided by him. As they walked through the gardens and towards an exit, she carefully cast a sideways glance at him. 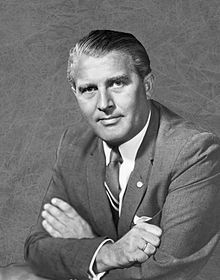 This man whom she held onto, along with Emperors Cherokee and Ndengin, had shared a glorious past which forged the very essence of what the Galactic Empire had become. The schism between the Vodo regime and the New Imperial Order was chaotic, but what the trio built from the chaos and the merger of the governments was awe-inspiring and was the fundamental keystone of the modern Empire. The triumvirate and their trusted advisors were not to be trifled with. Elaine's mind was buzzing while thinking about the risk she had taken and her clumsy maneuvering with her introduction to such a powerful figure. Elaine worried she had placed herself in a precarious situation with her bold actions when frightening thoughts struck her. The young Imperial shot a panicked glance at Director Seele; he wasn’t revealing any hint that he was aware of Elaine’s anxiety as he kept his eyes ahead on the door they were approaching. Lord Seele led her through the door into s vault chamber filled with numerous statues made of various stones of mixed hues. Seele gestured towards the wondrous collection of carvings and Elaine released his arm as her mouth opened in awe and she walked closer to examine these pieces of art in detail. The first statue that drew her attention was an obsidian figurine of a young human mother and child. It was only a foot tall, but the fine detail and life-like pose made it seem like someone had shrunk the two figures after they had been encased in carbonite. The evening drew on and Elaine, like a child in awe, wandered with the Director - hovering near his side while passing from room to room and hall to hall as the party drew towards to an end. Elaine arrived to the Regional Government’s offices for her Region with great enthusiasm, throwing herself relentlessly into her work. Projects once left unfinished were rapidly seeing completion under her supervision. Engrossed in her belief of the Empire’s political party of COMPNOR she quickly began integrating design ideas from across the Core into the architectural projects she undertook. Her ability to rapidly accomplish tasks quickly drew the attention of various senior officials and with it, increased expectations, ever and the driver of progress she devoted herself to these new standards with renewed fervor. Rising through the ranks of Regional Government, she grew to appreciate and tolerate the views of several Class B Citizens and even drew a few of them into her personal staff. She was afforded authority over making plans for the development of the planet ████████, which she unveiled to refugee leaders fleeing the tyranny of the New Republic amidst a COMPNOR rally. Elaine’s tact for management and attention to detail rapidly drew the attention of her superiors at the Academy. With the Dean falling into a state of critical illness, the Commandant, and most senior authority under the Minister of Culture in COMPNOR, made Elaine the acting Dean of the Academy. As time passed she performed her duties with fervor, pushing to modernize content and ensure the quality of Imperial training materials while raising academic Imperial standards. With her continued drive for progress, she was officially made Dean. Her time as Dean was short as her duties with the Bureau demanded increasing amounts of her time. As a result she abdicated the post, nearly a month after assuming it, passing the position over to Assistant Secretary Arya Solus. Leading the Bureau's Surveillance Department meant Elaine monitored news both locally and across the Empire, to some extent - that is, if she wasn't already writing or editing it for accuracy. As a result of her part-time work for the Ministry of Culture and her firm hand on ancillary news networks, the Ministry had asked to chair the Department. Naturally, she had accepted the offer, and embraced her role with an unprecedented drive to capture events around the Empire. Elaine listening in on a briefing. In mid-year 18, Veritrax transferred from Regional Government to the Imperial Security Bureau. As was standard procedure, she was sent to ISB Headquarters on Coruscant to begin her probationary period. Her training officer, ████████, wasted no time and began to put her through rigorous training. Her training included studies on law, policy, risk management and physical training to prep her for both overt and covert operations. She quickly rose to prominence with her presentation of both innovative ideas and unorthodox methodologies, graduating from her training and subsequently assuming the post of Regional Liaison for the Empires capital, the Emerald Region. Within the first month in the capital she had effectively gathered Agents and informants she trusted into her Bureau operations, seeking to consolidate and set a firm stance on all Bureau operations in the Region. Her strict and often harsh actions quickly brought planets and aristocrats in the core back into line with the Empire’s ideals. Impressed with her quick consolidation of the Empire’s law enforcement units in the Emerald Region, the Directorate sought to expand her responsibilities and give her dual command, both as Regional Liaison and Chief of Surveillance. She fervently initiated an overhaul of the program seeking to create new doctrines and reporting methods while improving operational capacity and compartmentalization of information. After reorganizing and re-equipping Surveillance to take on both domestic and inter-galactic threats, Elaine took to Coruscant to work on procedural plans for compartmentalizing data. The Department of Surveillance had aligned itself to rely on a constant stream of intelligence gathered by teams of surveillance professionals. The Surveillance professionals' work subtly affected ongoing counter-terrorism, foreign counterintelligence and criminal investigations efforts. She ensured that the Bureau was furnished with timely and accurate information which was utilized to provide verdicts and make recommendations to support senior decision makers in taking action to mitigate threats and hazards to Imperial facilities, assets and citizens. On Year 19 Day 355 Elaine and Draelor Nah`utal were named Ministers, joining the Select Committee of the Empire’s Central Government. COMPNOR served not only as the pseudonym for the Central Government but also the Empire’s Political Party, or as Elaine refers to it fondly “The Party”. Assuming the role as Minister of Culture she accepted the daunting task of ensuring that the Empire’s ideology was properly disseminated and that the populations loyalty remain steadfast. Her tenure as Director of the Information Services coupled with her time as Chief of Surveillance gave her a head start on developing a plan of action to rekindle the flames of propaganda across the territories held by the Empire. She immediately set about securing funding for expansion of the Ministry and hired key officials who were already distinguished officers. This group of “true believers” embodied the spirits of the New Order and threw themselves with great energy into influencing others. These key figures such as Arya Solus, Patrick Mueirech, and Lirri Elysar began the rapid modernization of their departments to deeply engage the populace drawing them out of their private lives and encourage public interaction with the State. While operations quickly expanded in public eye, other more subtle changes began to occur. The development of new media and banners flourished under the guidance of Sven Jazzel. These artistic developments in the name of Culture would draw viewers from across the galaxy. Krakonico Petermind, pushed for greater involvement with the Sub-Adult Group advocating for funding to develop the Empires future leaders all while directing celebrations of important victories across the Empire. The Ministry’s growth and engagement soared and continues to do so seeking to draw more and more people to the Party. An immediate focus for Elaine was the reorganization and development of the Empires propaganda arm. To this purpose, she met with her Secretaries and agreed to the appointment of two highly competent officers to chair two section of the Information Service. Phaedra Thester was announced as Chief Editor for the Empires popular magazine the Iron Will. While this occurred Owen von Ismay was named Chief Archivist and began the long progress of logging historical events. Expand this section to see former positions. Elaine is an attentive and ruthlessly disciplined perfectionist - both as a result of her upbringing and her Imperial Training. She possesses an incredibly high level of attention to detail; this, combined with her nearly hardwired need to be perfect, creates a work ethic that is unparalleled. She frequently enjoys the luxuries of fine wines and foods afforded to her as a member of the Imperial Officers Corps. Her loyalty to the New Order is unquestionable as she seeks to extend the influence of the Empire beyond its borders. Her daily activities nearly entirely consist of her work, hosting dignitaries, attending exhibits or working with the central government on laws and policy. During free time she is known to attend youth rallies and give lectures preaching the philosophy of the New Order. As a staunch believer in High Human Culture she barely tolerates non-humans employed by the New Order within her presence, and her expectations of them are even higher. "It is my belief, that the human element is failure; as stewards of the New Order we must adhere to the strictest standards in order to combat this flaw in our nature." - Elaine speaking to Recruits at the Imperial Academy. Elaine has, through the course of her education and professional career, found herself learning to be able to speak a few languages beyond Galactic Basic. The languages include Minnisiat, Galactic Sign Language, Hapan, an acute understanding of Huttese, and some Mandalorian. Her ability to interact with various sects of sentients in the Empire has often resulted in the peaceful integration of travelers into Imperial Society. This page was last modified on 20 February 2019, at 05:19.